Osborne was graduated from Harvard in 1884 and married Agnes Devens of Boston in 1886. She died only ten years later, leaving four sons, Charles, David, Lithgow and Robert. In 1886 Osborne assumed the presidency of the farm machinery manufacturing business which his father had founded. In 1903 the company was acquired by the International Harvester Co., in what was at the time one of the largest mergers in U.S. history. The merger left Osborne free to pursue his other interests, including politics, where he was an anti-Tammany Democrat. His son Lithgow recalled once that campaigning with his father could be a nerve-racking experience, for he never hesitated to say what he believed and never compromised. In 1913 Osborne was appointed chairman of a State Commission on Prison Reform. It was in order to get first-hand knowledge of prison conditions that he decided to become a prisoner for a week. [T]his experience . . . turned Osborne from an intellectually committed prison reform activist to the prophet of prison reform which he became. On Monday September 29, 1913, using the name Tom Brown, Osborne went "underground" in Auburn Prison as Prisoner No. 33,333x. Within Prison Walls is his prison diary. In the simpler times earlier in the century, Osborne's adventure was electrifying. Osborne illuminated the "grey" darkness of early twentieth century prison life in ways which at the close of the century seem naive or, perhaps, quaint. . . .
With the publication of Within Prison Walls, Thomas Mott Osborne became a force to be reckoned with on all prison issues. Together with a former fellow prisoner, Jack Murphy, he formed the Mutual Welfare League as an attempt to train prisoners in self-government and to prepare them to return to society. The Motto of the League was simple enough: Do Good. Make Good. In December 1914 Osborne assumed the leadership of a large and volatile situation at Sing Sing. Of course as an upstater who had not come up through the Westchester political machine, the problems were mainly from outside the prison. Yet, Osborne was able during a stormy two-year administration to establish the role model for correctional professionals who, like Osborne, asked his question: Shall our prisons be scrap heaps or human repair shops? After his resignation as warden of Sing Sing in 1917, having successfully tackled a long series of challenges to his leadership, Osborne went underground once again. This time at the request of the Secretary of the Navy who had asked Osborne to make a study of Naval Prisons. Osborne was joined by another imposter/investigator, Austin H. MacCormick. Austin MacCormick, who would lead the Osborne Association for 40 years, left his teaching position at Bowdin College to serve under the newly appointed warden of the Portsmouth Naval Prison Lieutenant Commander Thomas Mott Osborne. The Osborne-MacCormick team was an imaginative, if controversial, force against the naturally conservative tendencies of naval tradition. Backed, however, by a new assistant secretary, Franklin D. Roosevelt, an old friend from New York, Osborne had a strong supporter in Washington. Osborne retired from the Navy in 1920 and devoted himself to the organization which today bears his name. Among his activities in the last year of his life were inspections of several state prison systems. He died, at the age of 67, on October 20, 1926. After final services in the prison chapel at Auburn Prison, he was buried in a Portsmouth prison uniform. Robert (1896-1955), David, Lithgow (1896-1982), Charles (1889-1961). 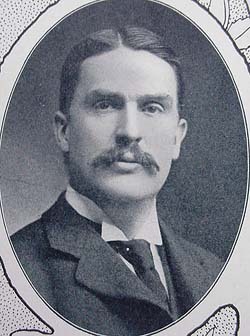 Thomas Mott Osborne was a member of the Fort Hill Cemetery Board of Trustees from 1891 to 1903.